"I must pay £3.75 to use the local track. I do not think in any way that I am worthy of huge support but get frustrated that, as a UK record-holder and European medallist, I can't even get into a track for free." - European junior 10k silver medallist Simon Lawson talking in an Athletics Weekly where it was announced he's quitting the sport at the ripe old age of 19 as he's tired of dealing with the British bureaucrats, who (among other things) criticized his 180 mile weeks, wouldn't let him double at Europeans and make him pay to practice on the local track. Lawson would make old-timers smile as he never considered himself much of a talent - he just "trained like a mad man." Say it is a fair question: Is Ritz on drugs? How many of you log onto to LR first thing when you wake up? When, if ever, is it moral to leave your wife if you have children? Maria Mutola Is Enjoying Retirement As Dominant Striker In Top Women's South African Soccer League Mutola: "We've played five or six games, and I've scored eight or nine goals. I scored four in the one game." Kim Smith Dominates Half Marathon In Massachusetts As She Gets Ready For Virgin London We wonder why she didn't run the NYC half. 2007 WChamps Bronze Medallist At 800, Mayte Martinez, Is Looking Forward To This Summer's Europeans In Barcelona She says she's in the best shape since 2007. Vin Lananna On Oregon AD Position Lananna says he hasn't talked to anyone about it. Lananna's quote: "... I think the athletic department is a wonderful and special place. We'll see how it plays out." Recommended Read: Irish Times Article On Colm O'Connell And Kenyan Success It's simply amazing to read about what Irish-born Brother Colm O'Connell has done with Kenyan runners. Marathon Winner Disqualified Over Technicality - What Do You Think? He signed up for the half marathon but made a wrong turn and ended up on the marathon course. Kenyan Women Head To Poland Knowing Tirunesh Dibaba Is Waiting With Kenenisa Bekele and Zersenay Tadese sitting out the event, the Kenyan men will have a good shot to win in Poland. The Kenyan women and Linet Masai will have to contend with Tirunesh Dibaba. *Polish National Women Take Nearly Half An Hour To Run Muddy, Snowy 8km World XC Course The best women's XC runners in Poland could barely cover the course that will be used for Worlds in under 6:00/mile. Caster Semenya - Her Future Still Undecided Interesting quote from her father. HJ Icon Stefan Holm Wins Wrong Footed High Jump Competition In Sweden Holm has cleared 2.30m 130 times in his career. Stephen Mokoka Wins 1,500/10,000m Double At South African Champs His 1,500m win in 3:38 is described as the surprise of the meet. 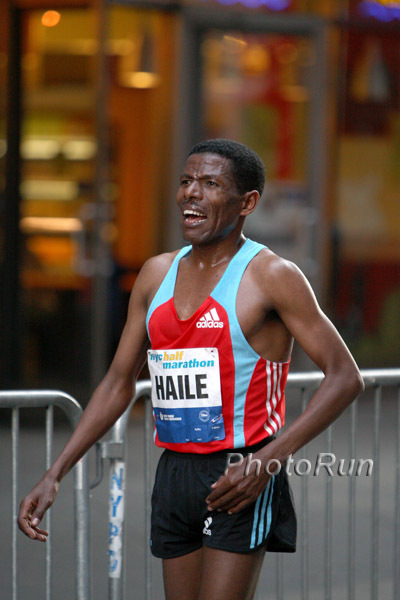 LRC Favorites Fall In Dramatic Fashion In New York The Haile Gebrselassie coronation did not go as planned, as he inexplicably pulled off the course while running with eventual race winner Peter Kamais in mile 8. Deena Kastor built a huge lead in the women's race, running on course record pace, before being reeled in by a determined Mara Yamauchi.